Options in India: Do not take that call from a headhunter!! Do not take that call from a headhunter!! The last one week for me-has been a very hectic week –forcing me to have my first longest break of over 8days of not blogging!! Some desperate deadlines from clients, implementation of a software at work, lot of interviews, apart from structuring an orientation program for new hires..all seemed to take longer time than envisaged. Ironically, this was also a time when lot happened in the business world- NASSCOM meet @ Mumbai, Vodanfone announcing its plans for India rather with a big bang, and a whole lot of exciting stuff. 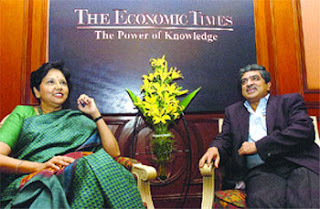 However, what takes the cake is the Economic Times interview of Indra Nooyi by Nandan Nilekani which is a delight for any management student. A long freewheeling chat covered issues like business, India, Pepsi’s future plans and some insights into the personal life of a very successful professional,especially in the light of the pesticide halo around the company in the recent past!! It is a looong interview..and a masterpiece. A must read! 1.events leading from Pepsi's slogan of "fun for you" to "better for you" and now, to "good for you"!! 3.participating in the theme of 'inclusive growth in India'- by creating jobs in rural areas. Be it chillies, tomatoes, potatoes or citrus, the company has been helping farmers increasing their yield, improving harvesting methods and helping farming in India by driving agricultural production and farmer incomes! 4. tips on how she has managed her personal space-while climbing the professional ladder! 5. Utlimately,it is the people that will make or break the company..not the assets, not the brands!! And yes, the single most point that she advocates..love the company so much -so that you dont take the call from headhunters! !